« Tile and Grout Floor That Needs To be Cleaned! 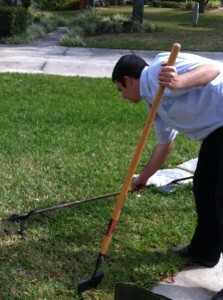 Tampa Bay Carpet Cleaner provides much more than Clean Carpet! While cleaning Tile and Wood floors in the New Tampa area, cleaning specialist Brady Steeves removes a Snake that was in the garage of a family’s home. This entry was posted on Sunday, February 19th, 2012 at 1:02 pm	and is filed under Carpet Cleaning, Hardwood Floors, Tile and Grout Cleaning. You can follow any responses to this entry through the RSS 2.0 feed. Both comments and pings are currently closed.